Preheat your oven and combine your flour, salt, and baking powder. Preheat your oven to . In a medium sized bowl, combine your flour, salt and baking powder with a spoon. Set your bowl of dry ingredients aside until you’re ready to use it. Cream your ****er and add sugar, vanilla, and eggs. Place your softened ****er in a large mixing bowl. Starting at a low speed and gradually increasing to medium speed, cream your ****er with an electric mixer until it’s pale and fluffy. Add your sugar to the ****er and continue mixing at medium speed. Then add your vanilla and eggs and continue beating until they’re combined in your mixture. Add your dry ingredients and milk to your ****er mixture. Add half of your flour mixture from the medium bowl to the ****er mixture and mix at a low speed until it’s combined. Add half of your milk to the mixture and mix until it’s combined. 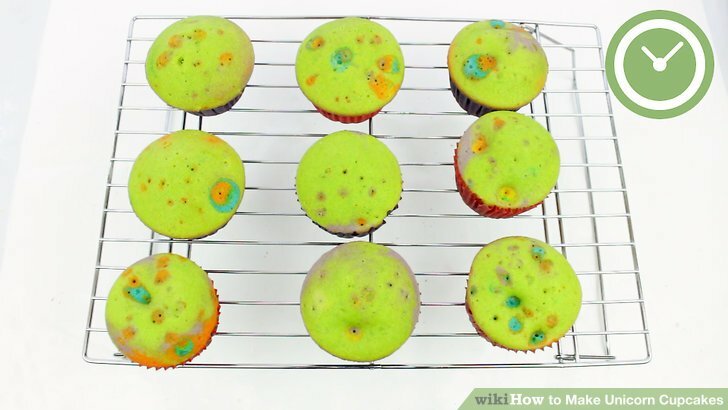 Bake your cupcakes at for 15-20 minutes. 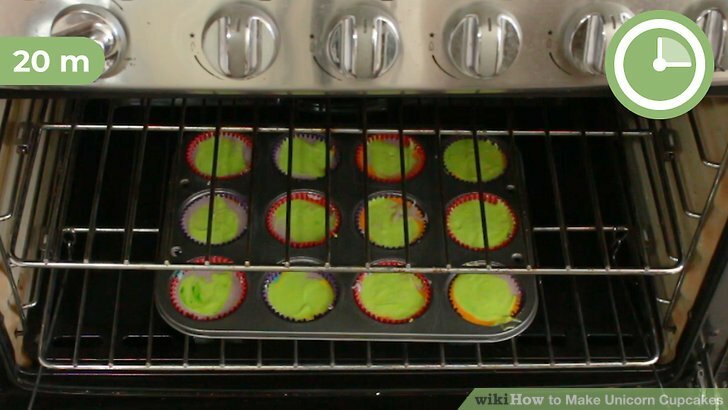 Open your preheated oven and carefully place your tin of cupcakes onto a middle shelf in the oven. Set a timer for 15-20 minutes. While your cupcakes are baking, you can begin making your frosting. Cream your ****er and vanilla for your frosting. Place your ****er into your large mixing bowl and add your vanilla. Starting at a low speed and working up to medium, cream your ****er and vanilla with your electric mixer until the ****er is pale and fluffy. Add your confectioner’s sugar one cup at a time while mixing. Take your confectioner’s sugar and add it one cup at a time to the ****er mixture. Allow each cup of sugar to combine before starting the next one. If you would rather your unicorns have a smooth face, use a ****er knife to evenly spread a layer of frosting on each cupcake. 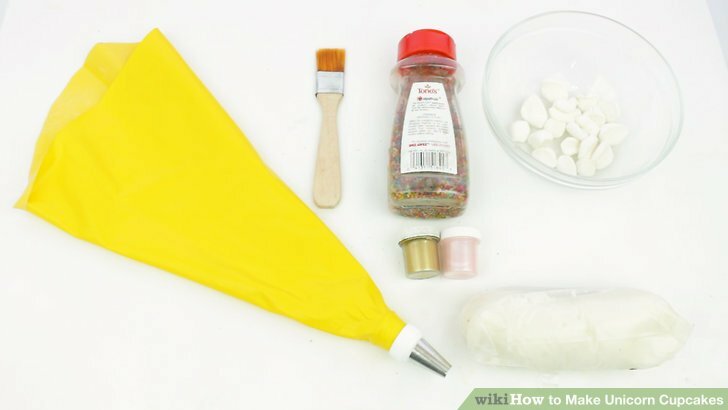 Make edible unicorn horns out of fondant and edible gold paint. Take your fondant and roll out two thin pieces about in length. Twist the two pieces together to form one spiraled horn. Pinch the end lightly with your fingers to make the top pointy, and smooth the horn by rolling it back and forth either between your hands or with an icing roller on your counter. Sprinkle rainbow sprinkles or edible glitter around your unicorns' faces. Take your rainbow sprinkles or edible glitter to add a bit of sparkle to each of your unicorns. And then congratulate yourself on a job well done!